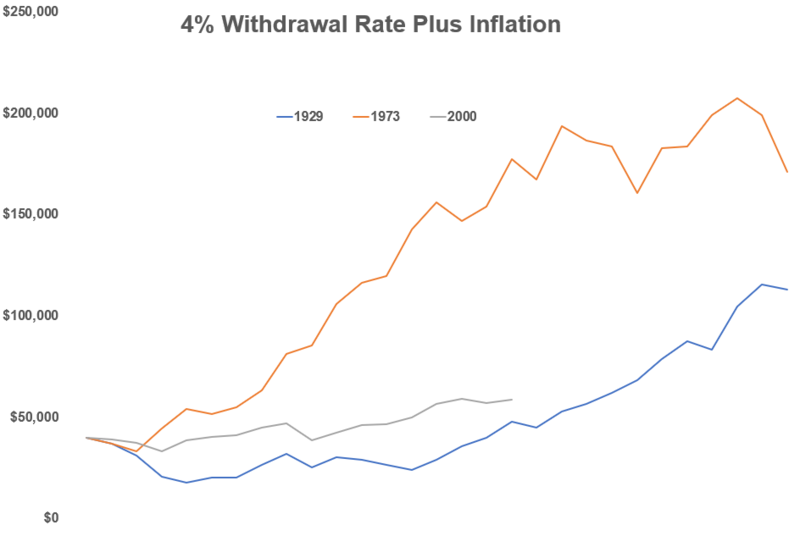 William Bengen first wrote about the 4% rule in a 1994 research paper for the Journal of Financial Planning called Determining Withdrawal Rates Using Historical Data. 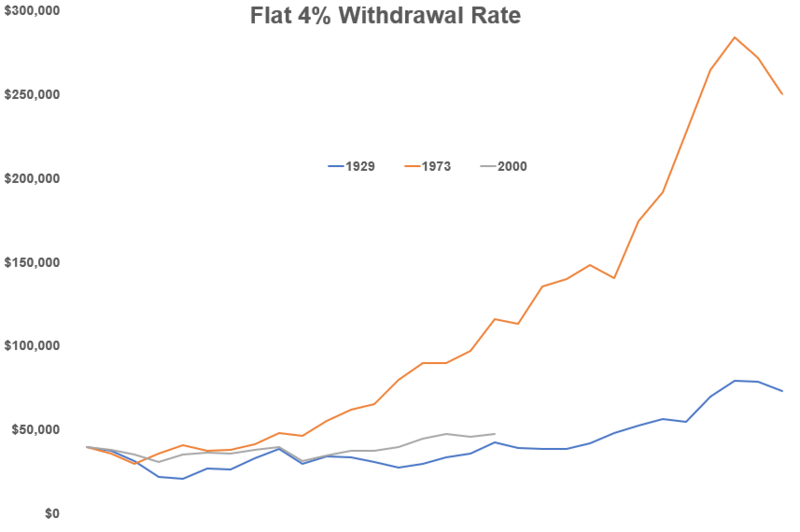 He proposed a safe withdrawal rate of 4% of a portfolio’s value in the first year of retirement, an amount which is used as a baseline for spending going forward. Each year thereafter, you would increase that initial amount by the rate of inflation so your spending keeps up with the cost of living. Retirement nerds have been running Monte Carlo simulations and debating the merits of Bengen’s 4% rule ever since. In my post from earlier this week — What If You Retire at a Stock Market Peak? — I used a simple percentage of assets approach along with an increase in spending rate by inflation. This approach takes market fluctuations into account when determining the amount to spend each year so some would view it as not ideal especially when the market tanks. In both instances, your spending rate would have fallen by about half within the first 5 years of retirement in the Great Depression scenario. Many retirees would find this situation untenable but would anyone truly expect their spending levels to remain constant during a deflationary depression? The declines in spending weren’t as severe in the 1973 or 2000 start dates but they were ramped up considerably during the 1980s and 1990s bull market. I received a ton of feedback and questions about my methodology and requests for further scenario analysis on withdrawal strategies under these worst-case situations. By far the biggest request was to see what things look like using Bengen’s 4% rule. The fact that each of these scenarios “worked” should give investors a sense of relief but it’s important to remember these things never work in a straight line. However you choose to draw down your portfolio over time, there’s going to be some give and take depending on your strategy. Just as there are no perfect investment portfolios, there are also no perfect spending policies. Every policy will require some trade-offs between current and future spending needs. Higher expected returns lead to more short-term volatility, while predictable spending patterns tend to accompany lower expected returns. That means you have to consider spending goals in terms of the current market value of the portfolio along with the sensitivity to past market values and spending levels. Spending rules are meant to help deal with the trade-off between the desire for long-term capital preservation and short-term spending smoothness. 1. Percentage-of-Assets Spending Rate. This policy would simply use a fixed percentage (say 5 percent of total assets) and grow it by the rate of inflation each year. Pros: It’s a simple policy. Cons: Your spending amount will vary considerably if you have a portfolio invested in risk assets. 2. Smoothed or Moving-Average Spending Rate. To smooth out the potential volatility in the annual payout many funds utilize a moving average. For example, you could take the average of the previous three or five years’ spending amounts to determine your current spending amount or rate. Pros: Less variable than a flat rate and a relatively simple policy. Cons: Current year spending could be determined by stale values in the past that don’t reflect new organizational or market realities. 3. Hybrid Spending Rate. This is a combination of the first two where you could use a partial dollar amount grown by inflation and a partial smoothing factor. You could also add a ceiling and a floor to keep things in line and not go too high or too low when times are either wonderful or horrible in the markets. Swensen says that Yale’s endowment utilizes a hybrid approach that’s equal to 80 percent of spending in the previous year plus 20 percent of the long-term spending rate. Pros: Reduces the impact of volatile investments on current spending. Cons: Introduces more complexity into the equation when trying to balance the current and past values. Institutional investors are different from individuals in many ways considering many of them continue to receive donations into their funds over time but the thoughtful way in which many of these organizations go about setting spending rates can be instructive for individuals. The goal for both groups of investors is to avoid running out of money but still taking out enough each year to have a meaningful impact. I don’t think it’s possible to completely ignore the economic environment or market fluctuations when setting a spending rate in your portfolio. Maybe the most important thing for investors looking to live off their portfolio is to remember that CPI is just a number reported by the government. Your lifestyle inflation is the only one that truly matters so the biggest variable in all of this is not necessarily market returns (although that one’s a biggie), but your own wants, needs, and desires. What do you actually want to do with your money and how much spending is required to keep you happy? We have absolutely no control over the timing of the next market peak, the returns the markets throw off or the sequence of those returns during our retirement years. But we can control how much money we spend so that will always be the biggest lever investors can use when trying to control their own financial destiny during retirement.